For best results, make this recipe when juicy summer tomatoes are at their peak. Spread pesto evenly over bread shell. Place on large pizza pan or baking dish. Arrange tomato slices on top. Season with pepper. Sprinkle with olives and Monterey Jack or mozzarella cheese. Bake in a 425 degree F. oven for 10 to 15 minutes or until cheese melts and tomatoes are warm. Cut into wedges. Makes 8 servings. If a prebaked Italian bread shell is unavailable for pizza making, you can use a 10-ounce package of refrigerated pizza dough instead. Simply unroll the dough onto a greased 12-inch pizza pan, building up the edges slightly. Bake in a 425 degree F. oven for 8 minutes. If necessary, cover the edges of the dough with foil to prevent over browning. 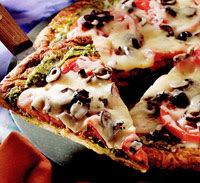 Proceed as directed in the recipes for Fresh Tomato Pizza with Pesto. Calories 374, Total Fat 22 g, Saturated Fat 5 g, Cholesterol 30 mg, Sodium 584 mg, Carbohydrate 30 g, Fiber 2 g, Protein 16 g. Daily Values: Vitamin C 15%, Calcium 27%, Iron 9%. This entry was posted on 1:17 PM and is filed under Pizza . You can follow any responses to this entry through the RSS 2.0 feed. You can leave a response, or trackback from your own site.